The founder and CEO of Pure Green, Ross Franklin, is a wellness visionary with over a decade of experience launching health and wellness brands. Ross is driven by his passion to make it easy and fun to live a healthy lifestyle and take Pure Green to become an internationally world-class brand. My personal vision is to transform the mainstream population into a healthy lifestyle. Before getting into the juice and smoothie business, I started my career working in the fitness industry. After years of working for many luxury chain gyms, I starting my own consulting agency and built a reputation among gym owners and CEOs as "the fixer" A.K.A. The Marcus Lemonis or Mark Cuban of the fitness industry helping struggling big box gyms and specialty boutique fitness concepts succeed in spite of increased competition of the low cost competitor model. I successfully opened up new 20,000 to 40,000 square foot fitness complexes throughout the Northeast and got them to thrive through intensive focus on marketing and sales. Liquiteria, a small juice bar in the east village of NYC with only a single location at the time brought me on to expand and grow brand. I found that the same marketing strategies that worked well in the gym business were just as effective in the juice business to the point where a small 600 square foot juice bar was generating more revenue per square foot than an Apple store. I found the smaller retail footprint of the juice business to be less risky and greatly more profitable than the fitness business. I was hooked and then went on to create Pure Green, thepuregreen.com where I enhanced and perfected the quality of the menu items and upgraded the ingredients to include powerful superfoods carefully sourced from all over world. Pure Green is in a league of its own. An emerging trend within retail is to create the "experiential factor." Top retail brands are making bold moves and aggressive changes to their model in the effort to create a lifestyle feeling within their retail locations where the focus is centered on the "experience" along with products. Lululemon's new store on 5th Avenue incorporates "The Hub Spot," a lounge for customers to hang out incorporating community driven events. Under Armour is creating a flagship retail location at the FAO Schwarz space on 5th Avenue—at a rent of almost 3k per square foot illustrating the significant investment to merge the "experiential factor" within retail. The "experience" trend in the retail setting is growing and I project we will be seeing many larger brands start to jump on the band wagon and integrate this trend into their model over the next 3 to 5 years. Pure Green is currently looking for strong retail brand partners to execute the "box within a box" model which for Pure Green has proven to be highly successful. With the rise of new cold pressed juice companies and the increased availability of cold pressed juice within supermarkets, corner stores and cafes, the category of cold pressed juice as a percentage of revenue has significantly decreased for juice and smoothie operators. Although cold pressed juice sales are down, the revenue is made-up with a higher percentage of revenue for smoothie and acai bowl sales. Consumers are smarter and better educated than ever before. In the New York City market, most consumers are already familiar with the benefits of cold pressed juice and are also aware that a handcrafted smoothie is far superior in nutrition to that of a bottled smoothie. Some juice and smoothie operators pre-bottle their smoothies to save on labor giving their consumers a nutritionally dead juice. Once the smoothie is blended and exposed to oxygen, the smoothie loses beneficial enzymes and nutrients by the minute. What you are left with is a dead surgery sludge. Aim for smoothies that are handcrafted and made-to-order. The heightened interest in handcrafted and made-to-order smoothies and acai bowls has created a great opportunity for Pure Green to expand its brick and mortar vertical. My inspiration for Pure Green stems from my passion to make it easy and exciting for regular people get into a healthy lifestyle. Many of my friends and family cringe at the thought of drinking a green juice but when they try it from Pure Green, the positive expression on their face is priceless. The products at Pure Green have all been meticulously crafted to taste amazing which serve as a gateway to get people hooked on eating and living cleaner. Pure Green has created strong alliances with brands that are major players within the world of fitness. Pure Green has recently launched a kiosk model at The Sports Center at Chelsea Piers and also created an exclusive relationship with NYSC with some new and exciting Pure Green locations coming soon. In the effort to expand nationally, Pure Green is opening up the company as a full-service franchise. Interested owners can contact info@puregreen.com where our team will help potential franchisees lock-down the best real-estate, negotiate the lease, build out the retail location and hire the team. Pure Green is focused on opening up over 20 locations by the end of 2017. 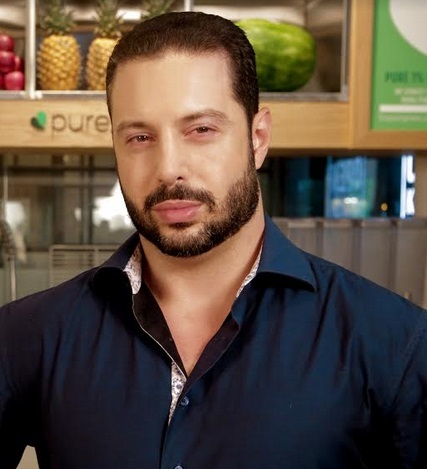 Pure Green has just recently launched a wholesale business division and has been highly success in on-boarding an interesting array of accounts ranging from high-end food and beverage vendors like Todd English's Food Hall at the Plaza hotel to high-end gyms like Drive 495 and Clay Fitness. Pure Green is continuing to open up retail brick and mortar locations throughout New York City and beyond. Getting sued is never fun and when you are the best at what you do and work with a wide range of companies, getting hit with lawsuits at some point within your career is inevitable. We all have the desire to protect our company and when a high impact player within your organization consults or works with another company within the same industry, there is always the need to defend. I have endured multiple lawsuits from various companies some even coming from a place of pure ego and malicious intent. One mega fitness company spent hundreds of thousands of dollars to come after me over a non-enforceable non-compete issue. Going through this type of legal debacle is a grueling and frustrating process. I've learned to never burn a bridge, never sign a non-compete and always have a shark attorney in your corner. My attorney has helped me to dodge more bullets than I can count, Joshua Levin-Epstein at levinepstein.com. At Pure Green, we consider the people that come through our doors as guests, our focus is to treat our guests the same way they would treat a guest in their own home. Warm, friendly and engaging hospitality is at the core of Pure Green as well as a driving force behind our operational execution. We are more than confident that our guests will love the taste and nutrition of our products. Our team's prime focus is to ensure that every guests leaves feeling "cared for" as we know that when this happens we will be seeing them again very soon. I believe that all elements within a retail operation reflects who is in charge. I have developed a top-down approach to leadership at Pure Green that starts with me and is executed down the ranks. Part of creating a world-class culture is to ensure the team feels supported. When interacting with my General Managers at each Pure Green location, I don't consider my role as their "boss," I look at my role as how I can support them and make them more successful. It gives me great pleasure to see members of the Pure Green team advance within their careers. I don't look at my role as motivating others, my philosophy is that if the right systems and processes are in place and the right people are in place, the team is self-motivated. If I ever have to put energy into motivating someone, chances are that they are not the right fit for Pure Green. In business and in life, if someone is ever costing me energy, most of the time the right move is to cut them loose—chances are you are probably doing them a favor. The best advice I can give someone to help advance their career is simple to follow your passion. If your career is aligned with your personal mission and vision, you will flourish in your career because you love what you do. If you do not have a personal mission and vision, then create one. Determine what you are most passionate about and how you can add the most value to others and achieve your dreams in the process. If you don't know what or where the target is, how can you ever hit it? Notice, I started this interview with my vision. What is yours?